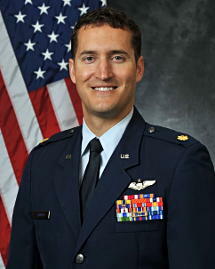 Major Benjamin A. Donberg is the Chief of the Fighter Portfolio in the Secretary of the Air Force’s Legislative Liaison office. Prior to this staff position, Maj Donberg completed the Air Force Strategic Policy Fellowship in the National Capitol Region. During the fellowship, he was assigned to the State Department and the Chief of Staff of the Air Force’s Strategic Studies Group. Major Donberg was born in Midland, Michigan and graduated from the University of Colorado, Boulder in 2003 with a Master’s of Science degree in Aerospace Engineering. Upon graduation, he earned his commission as a distinguished graduate of the Air Force Reserve Officer Training Corps. He graduated Undergraduate Pilot Training at Laughlin Air Force Base, Texas as distinguished graduate followed by F-15E training at Seymour Johnson Air Force Base, North Carolina. Major Donberg’s F-15E assignments include three consecutive operational squadrons at Seymour Johnson AFB and RAF Lakenheath. Additionally, Major Donberg graduated from the Weapons Instructor Course at Nellis AFB as a distinguished graduate in 2010 and completed the DARPA Senior Chiefs Fellowship Program in 2014. Finally, from 2007 to 2015, Maj Donberg has deployed five times in support of Operation Enduring Freedom, Odyssey Dawn, Inherent Resolve, Freedom’s Sentinel and operations in the Horn of Africa. Recently, Ben and and his wife, U.S. Air Force Major Jaina Donberg, parked their F15s just long enough to collect their brand new FAA Seaplane Ratings at NMC! Don't Miss Our 50Th Anniversary Event Updates! Do we have your updated contact info? Help us get the word out to your friends in aviation! Provide contact information for your NMC connections. Want to stay in touch with NMC?